Ronald C. Schott was one of the original community users and advocates for the use of Google Earth in Earth Science and Education. Sadly we found out this weekend, that Ron died last week of natural causes. In the early days of the Google Earth Community and related blogs, Ron was always the most positive voice, and led the charge for use of GE in Earth Science. It could be argued that he was THE original advocate as he was an early Keyhole user, and pushed the Earth Science / Education angle from those first days via his Geology Home Companion Blog. This all despite his traditional training as a geologist and focus on fieldwork. He saw there was a great opportunity for the science and technology to come together. His blog, along with his active twitter and G+ profiles have been credited by many in the Geology and EdTech (and both) communities as major influences on their own geology careers, social media and other writings. He was known for spending a lot of time helping and interacting with geologists, students and armchair explorers that he’d never even met but who asked for help. One of his pet topics was advocating for a Google Earth “Geology layer”, which ironically the new layers now has the potential to make possible. Ron was famous for his Gigapans - the one of his office is a classic. As part of the fun, Edi and Berti are often lurking in there (someone tell me which one I've pictured below?). 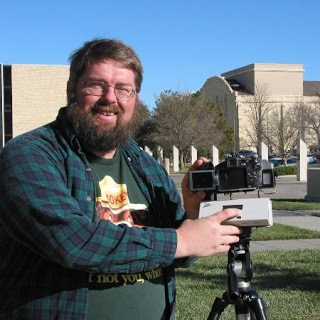 It was in this world of Gigapan imagery where Ron excelled, he was one of the original beta testers and had few peers. His catalogue of uploaded images stands as a unique contribution to the world Geology community: Ron Schott and his 1,000 Gigapans. He was also know for his excellent use of social media to promote Gigapanning and Gigapans and he did the same with Google Earth: his involvement in the #WOGE (Where on Google Earth?) game helped fuel an active blog and social media interest around Earth (and also led to the "Schott rule"). Ron was also part of the Virtual Globes at AGU sessions from day one, as both a contributor and organizer. Spun out from this, at the Penrose Conference held at Google in 2011, Ron organized the fieldtrip to the Marin headlands around using Google Earth “in the field”. We were later collaborators on on NSF-funded projects around using Google Earth and Geo for Education. Coming into the present day, it was somewhat surreal that Rich messaged John with the sad news that we’d lost Ron and it flashed up on John’s phone as he stood watching sunrise over one the world’s most spectacular outcrops: Uluru, a massive sandstone inselberg in the heart of the Australia’s arid "Red Centre". John writes: Although we’d both had fewer interactions in the last few years since I joined the GEO team, Ron was a friend, and a big part of the world that led me to joining Google, he will be greatly missed. Rich writes: Like John, I hadn’t spoken to Ron for a while at the start of this year. However, I’m active on Twitter and Ron was ALWAYS popping up in my timeline and liking my tweets over the years since the Penrose conference. The response to the news on Twitter shows it wasn’t just me, he was a huge part of many geologists experience on Twitter. Rich writes: Twitter led me to my last conversation with him, I had a hangout with him back in March picking up a thread of discussion on virtual fieldtrips. We chatted about a ‘road trip’ geology idea I’d had, as always he was a technical guru and gave me some excellent notes to consider, both technical and educational. We ended with me promising to set up a group web call with some other people about virtual fieldtrips, one of those ‘when I have the time’ ideas that we all have. Of course everything else intervened and, to my shame, it fell off my todo list. I feel sad to have missed the chance to hear his views on the recent developments in our field one last time. We also lost Declan de Paor this week, a separate blog about him to follow.